Walden Velo members are able to hire the club's bike boxes for trips away with the bike! The club has three Bonza bike boxes - Big Mig, The Pirate and The Lion King - each available to members for a fee of £15 per week or part thereof. The boxes are hard cases suitable for air travel (disclaimer: Walden Velo does not accept any responsibility for damage caused to the contents of the box when in use). We have weighed one of the boxes which came in at 12.7kg. The availability of each box can be seen on the three calendars at the bottom of the page. If you would like to make a booking then please email rentals@waldenvelo.com with your chosen dates and if a box is available it will be allocated to you on a first come, first served basis. The boxes are stored in Saffron Walden and can be collected by arrangement, however on occasion it may be that members are required to collect a box directly from the previous hirer where a faster turnaround is necessary. 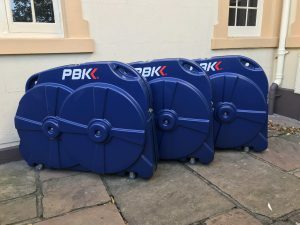 Please note that not all bikes will fit into the boxes, with some larger mountain bikes and time trial bikes with long integrated seat masts being the most likely to experience problems. Please contact us if you have any questions. Those hiring boxes will often be travelling abroad and hiring a car at their destination airport. It can be tricky to know whether the box will fit into the car you have chosen. We will try to help by building a small database of cars in the table below, and ask that on your return from any such trip you pass on any relevant info on your car hire/box compatibility experience. This will be of great assistance to us all.